Typography focused website designs allow to catch all users’ attention with content and make them stuck for hours reading and browsing the pages of your blog. That’s why, if you are a blogger or you’d like to launch an online magazine or newspaper, take a look at this WP theme collection. We’ve hand-picked the best typography-focused WordPress themes for portfolios, business websites, blogs, and multiple other concepts. Just see and enjoy! Don’t choose more than two fonts for your website not to create confusion and dissonance in the overall look of your web-page design. It’s essential to select fonts from one font family to make them complement each other while creating a bit different styles. This is a SEO digital marketing WordPress theme suited for agencies and marketers. The template is based on Elementor page builder which allows to easily build header, footer, or page structure using the drag-and-drop interface. more features of the theme include wide and boxed layouts, unlimited colors, typography options, and much more. This is important to pay attention at typographic hierarchy when you are creating a content for your website. Hierarchy means using different sizes, styles, weights of typefaces to create a consistent flow of your text as well as assign different importance to different pieces of text. For instance, heading and subheading are always bold and a bit larger than regular paragraphs. This is WordPress theme suited for a SEO, SaaS, digital, agency, or landing websites. It comes with 2 homepage layouts with different designs, different pre-made inner pages like blog layouts, galleries, services, pricing tables, and more. The template also comes integrated with King Composer page builder, Slider Revolution, Contact Form 7, and has a lot of features including WPML multilingual support, and more. Everyone knows of the importance to choose the right typography for a blog, but not everyone knows the history or fonts and typefaces they use. For instance Gill Sans – the best selling typeface of 20th century was created in 1928 by Eric Gill who was not only a typeface designer but also a sculptor, printmaker and stonecarver. This font was classified as “humanist” sans-serif face and it was meant to be legible both for display and text. 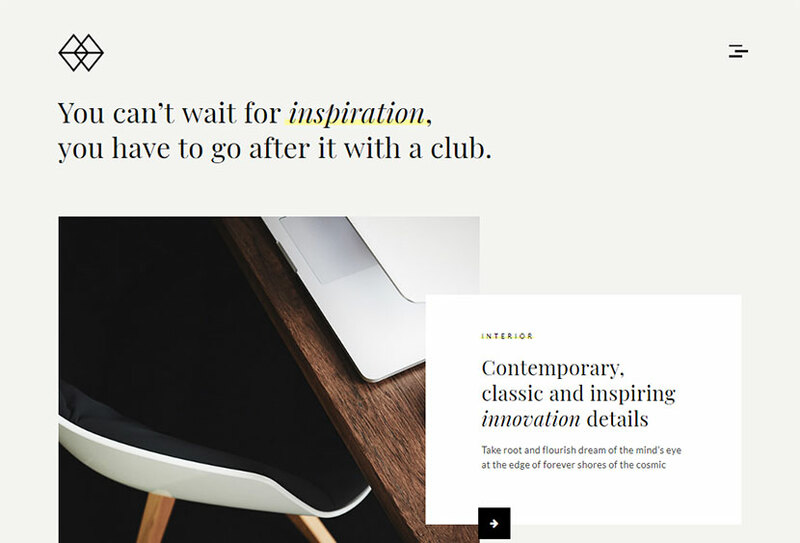 Take a look at this stylish typography-first WordPress theme especially made for personal streamlined blogs. The features of the theme include advanced admin panel, 3 main and 3 post layouts, unlimited color schemes – using colorpickers, 5 post formats, main and footer menus, hide/show most post elements option, custom background images, and more features. A specimen book of Linotype faces called Big Red was issued in 1939. This was the book contained more than a thousand pages of type specimens for hand-composed headlines and texts made with linotype machines. There were also the specimens for model ads and announcements where ornaments and borders were used in a great amount. There are lots of WordPress themes focused on typography, and Anotte is one of them. This is a lightning fast WP template with horizontal scroll, and it is specifically designed for photography websites. It comes with child theme included, horizontal and vertical portfolio post layouts, unlimited carousel sliders and simple image sliders, a shortcode generator, and many more features. Another remarkable moment in the history of typeface was the issue of ITC Typeface Collection book which was a quick manual of individual booklets released in the 70s. The book was released to encourage the manufacturers of typographic materials and equipment to license the ITC typeface library which included a lot of fonts such as Avant Garde Gothic, ITC Franklin Gothic, Lubalin Graph, Serif Gothic, Souvenir, and many more. 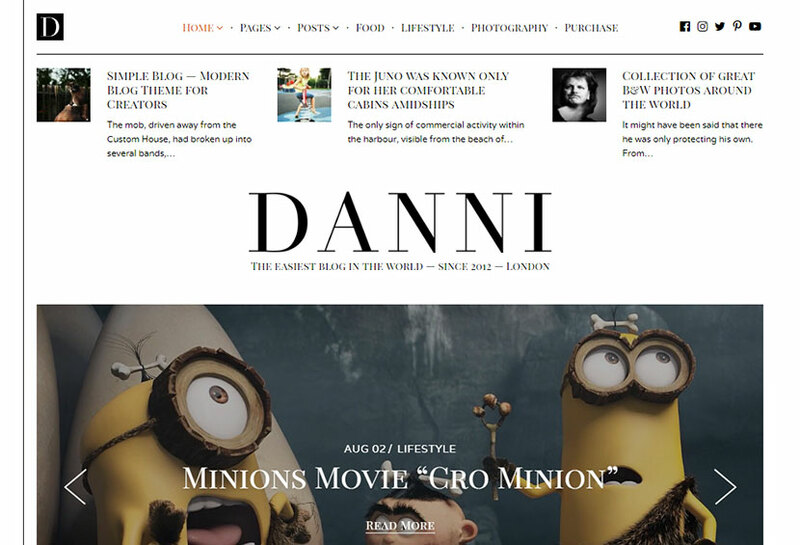 This WordPress theme catches the eye, and this is not in vain. The theme is manufactured to become a full-fledged blog, magazine or online store. It comes with affiliate links feature and advertising tool available. 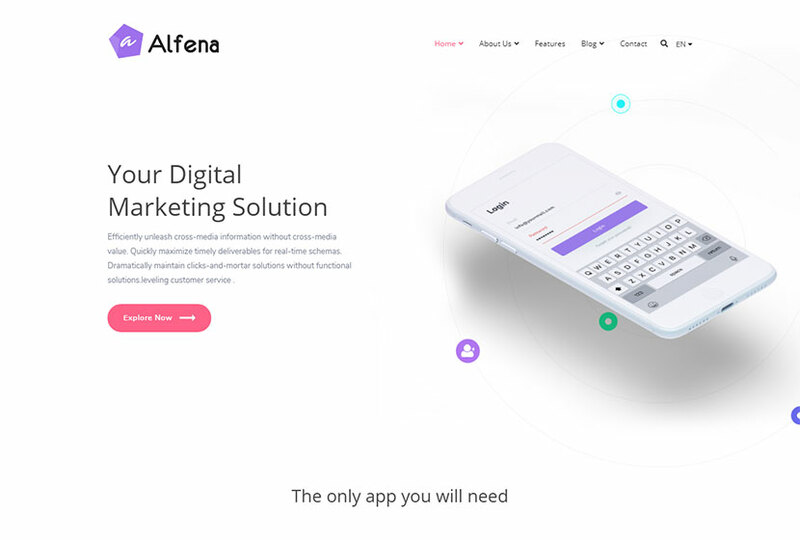 Clean and modern design, advanced blog page options, mega menu, built-in review system, infinite custom typography, and many more advantages are available. When selecting the right typography for your website, it’s important to consider the main concerns because the typography affects the overall design. For instance, when choosing two different typefaces for your website, it’s important to choose those that are similar in x-height (the height of the lowercase letter body). This will create consistency and harmony of your design. 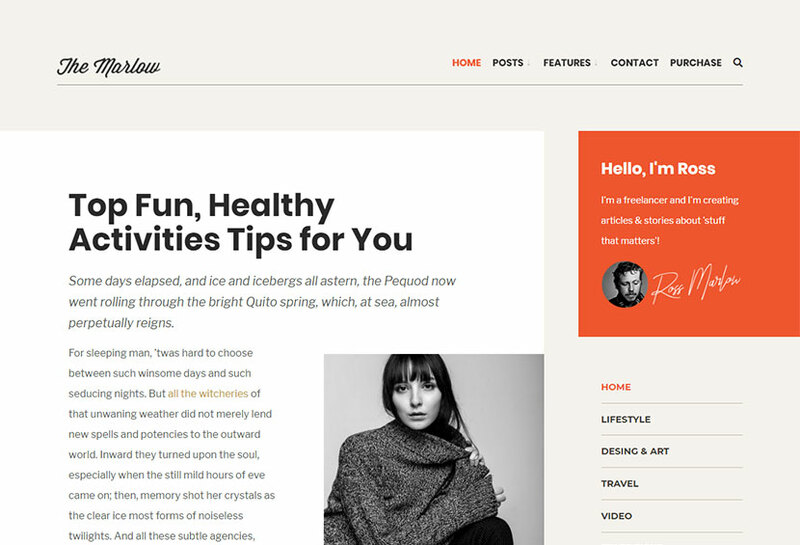 This is a nice blogging and mini-magazine WordPress theme with modern look and strong focus on typography. You can take it to use for lifestyle blogs, fashion magazines, and more related websites. 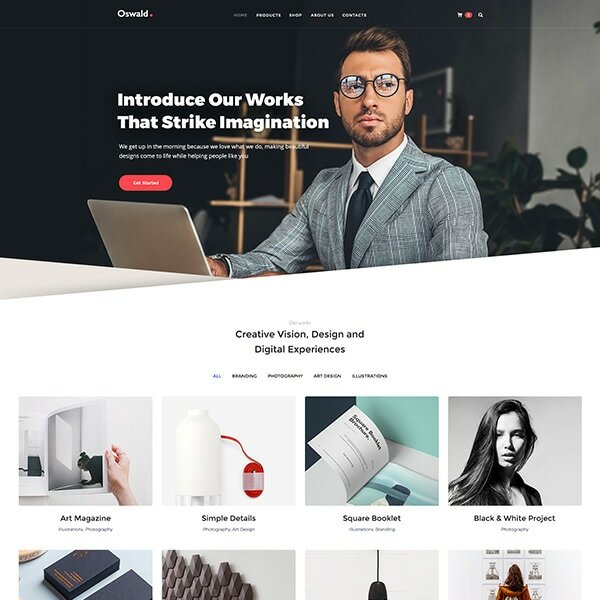 Features of the theme include minimal and clean design, 3 unique headers, 4 footer widgets, footer Instagram, 6 unique banners (boxed and fullwidth), and much more. The line height (or leading) is also important when selecting the typography for a blog or any other website. This means you should consider the vertical spaces in the text lines. The line height value should be 1.25 to 1.5 times larger than your font size – this is required for readability and legibility. 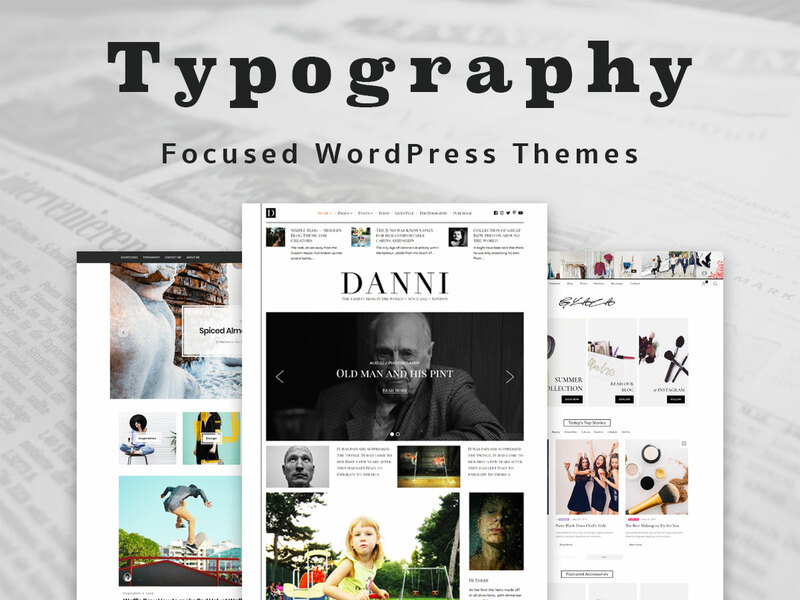 This blog theme has a strong focus on typography and allows to create either personal diary or a news magazine on the Web. 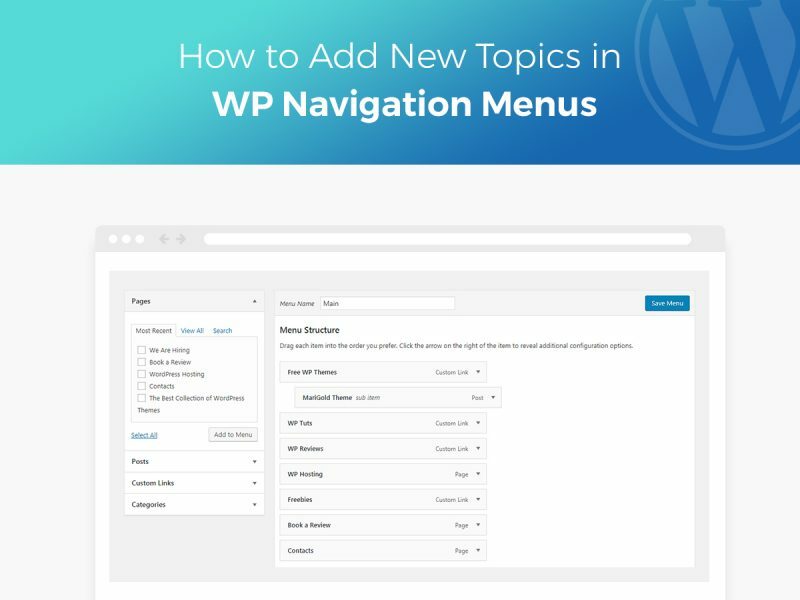 The template boasts features like popular posts under navigation, featured posts slider, 2 blocks for introduction, 2 column layout, suggested content dock, live customization, off-canvas mobile menu, and much more. Another thing to consider when choosing typography is kerning. Kerning is the space between letters as well as the process of adjusting letters to create the correct volume of space to avoid gaps or squeezed look of the text. Sometimes it’s necessary to tighten or loosen the kerning for creating a more attractive look of your posts. This is especially important when dealing with headlines and logos. 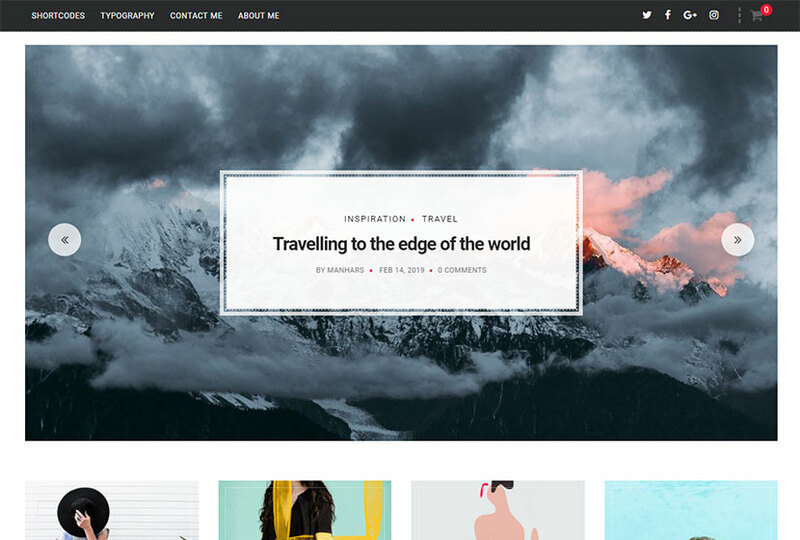 This minimal and clean WP theme is made for creating a cool portfolio and presenting your photography works in the best manner. It comes with child theme included, portfolio post type, simple image slider and gallery, shortcode generator, easy translations .POT, Contact Form 7 support, easy customization, and many more advantages. Tracking is also required to take into consideration to make a copy look perfect. Tracking is almost the same as kerning but it relates to the whole word spacing and this is managed after you’ve already done with kerning. Tracking defines the spacing between letters which is required to check and correct after your kerning is made perfect. 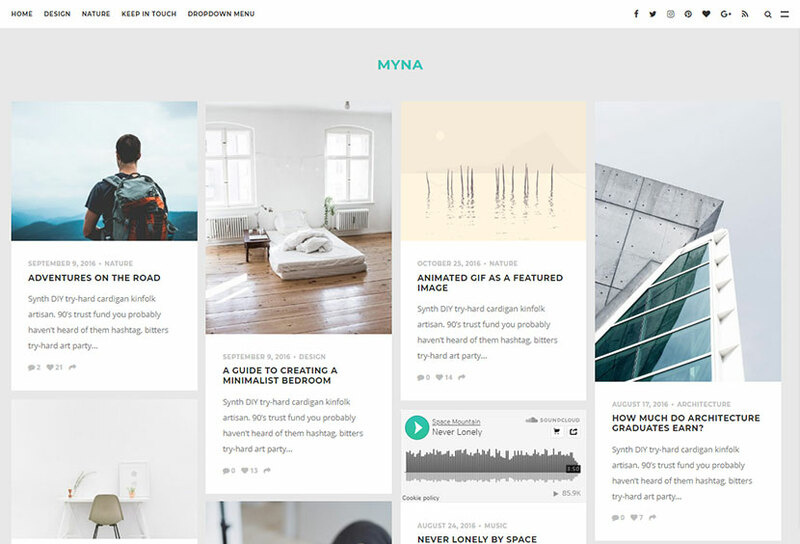 This WordPress theme is for those who want to create a nice blog on the web and share their stories with readers. The template is focused on typography and images, so it provides you with really great user experience. 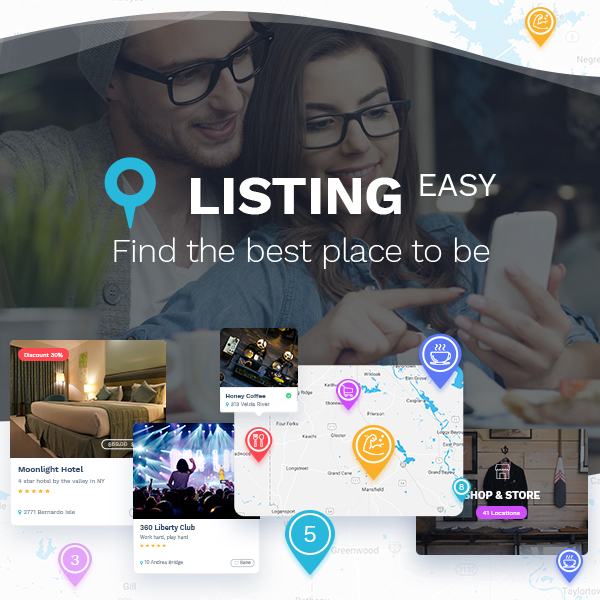 Big bold menu, infinite scroll, trending posts option, WPML support, child theme compatibility, ultra responsive design, and many more features are available. Measure is another characteristic which is important when you think about the best typography for your website. Measure is the line length and it should be adjusted either to make it longer or shorter depending on your design and the overall harmony. The harmony of photography and typography is observed in this WordPress theme. This elegant WordPress theme is focused on content and intended for creating a beautiful blog or shop on the Web. It comes with a multitude of homepage layouts including such as classic, standard, list, grid, boxed, texton, and some more. The theme also has a tremendous amount of features including mega menu, different post formats, color options, Contact Form 7, and many more. When choosing a typeface for your website, readability should be a priority. Make sure that the font you use suits your market and your audience and that your texts are written flawlessly. It’s important to choose the typeface depending on the communication channel where you suppose your audience is going to read the texts written with your chosen font. This is a minimal and elegant WP theme focused on content and providing great reading experience for users. 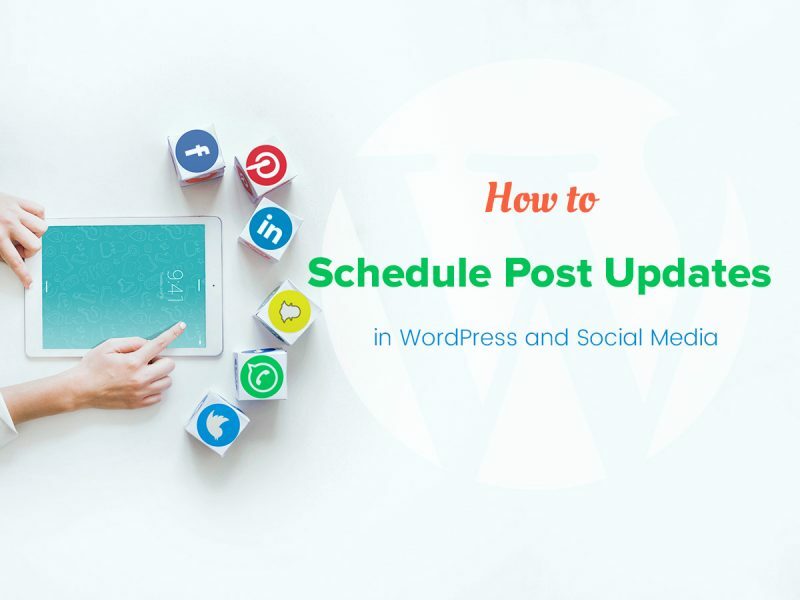 It boasts off-canvas menu, minimal masonry design, a social bar and media feed that will assist in making your blog the one which really stands out. Unlimited brand colors, custom widgets, advanced admin panel, and many more features are available for the theme. Alignment of your typography also affects the readability of your text. Left alignment is the most popular one because it makes your copy easier to read. Center alignment is only appropriate when you create a poster or branding, as for the right alignment, this is mostly used for epigraphs. When it comes to the justified text, this is more suitable for multi-column layouts. This WordPress theme is a minimal looking design made for photography websites and focused on typography. The templates comes with Child Theme Included, Portfolio Post Type, Google Web Fonts, Image Slider and carousel sliders, shortcode generator, translation ready origin, easy customization, and many more advantages. What other collections you’d like to see? We are happy to be helpful, so please tell us what collections of themes you’d like to find on our blog. Thank you in advance.